Twenty years. That’s how long Tuilaepa Dr. Sa’ilele Malielegaoi has steered Samoa’s ship as the Prime Minister and the leader for the ruling Human Rights Protection Party. Today, Tuilaepa has arguably become the longest serving Prime Minister in the Pacific, if not the world. Whichever way you look at it, this is a milestone for anyone, quite an endeavour. It is both impressive and rare. It calls for a time of celebration, reflection. Come to think of it, it’s certainly not a bad achievement for a boy from Lepā whose fight, determination and commitment to succeed against all odds has become the inspiration for any Samoan from a humble family, who wants to dream of making it big. If the boy from Lepā could make it, why couldn’t another boy from another village do the same? Indeed, today marks the continuation of a fascinating journey that started from Lepā when Sa’ilele as a young boy came to Apia determined to be educated. The first stop was Marist Brothers, Mulivai, St. Joseph’s College, Lotopa where he won a scholarship to study at St. Pauls College in Auckland New Zealand. He continued on to Auckland University. Armed with a Masters and Bachelor of Commerce degrees, he did not become a politician right away. He had to learn the ropes, understand the system so that in the 1970s, he was employed at the Treasury Department where he later became Deputy Director of the Economics Department. Between 1973 and 1978, he was Deputy Financial Secretary of the Government until 1978, he and his Gillian moved to Brussels where he worked until the 1980s when they returned to Samoa. It was while he was a working for the Coopers & Lybrand accounting firm when he entered politics in 1981. On this day 20 years ago, after 17 years as a politician, Tuilaepa as the Deputy Prime Minister and Member of Parliament for Lepa then, was sworn in as Prime Minister. He is only the sixth person to have held the role since Samoa became independent in 1962. The day was even more significant as it was when he stepped up to replace his mentor for many years, former Prime Minister Tofilau Eti Alesana, who has since passed away. The rest as they say is history. Love him or hate him, there is one thing that cannot be denied. Tuilaepa is a hard worker who has done a lot of good for this country. He has seen the worst and the best of times, having played a critical role in the policymaking, and governance of this nation, longer than anyone else. He has survived the harsh realities of developing a nation with no money and few natural resources. He has had to learn the ropes of party politics, where Samoa has experienced many extremes—including a public servants strike, a political assassination, public sector reforms, a struggling economy and countless other challenges. How has he managed all this? It’s quite simple. While everyone talks about his other attributes as a leader, what we don’t often hear is his work ethic, which is unrivalled. People who know him close enough will testify to this. Tuilaepa is undoubtedly the hardest working politician in Samoa today. From a public observation perspective, all you have to do is look at the way he carries out his role in public. On any given day, Prime Minister Tuilaepa would have so many speaking engagements. They start from the morning and they go right into the night. He never says no to anyone, regardless of what the occasion is. Some people often joke that Tuilaepa could even rock up to open a small kitchen if you invited him to. But that is the nature of the man. He is approachable, hard working and Samoa today simply would not be the same without him. Does he have faults? Of course he does. Plenty. Tuilaepa is human after all and as long as we are human, we are prone to faults and mistakes. The Prime Minister is no exception. As he marks this milestone today, one of the biggest criticisms of his leadership is the number of things he has changed. From butchering the Constitution blue, to moving the dateline forward, switching from right-hand to left-hand drive and countless other changes—there are grounds for people who say Tuilaepa is only interested in legacy projects, where he would be remembered. But this moment is not the time to talk about those things. Today is a time to rejoice and be thankful. 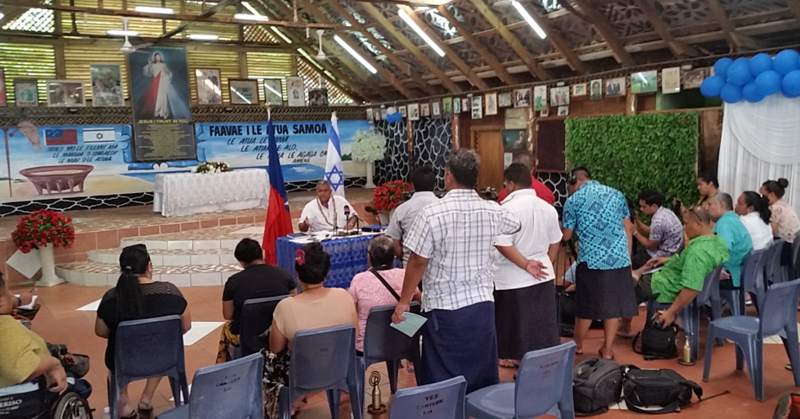 We acknowledge God for the leader he has given Samoa. We are grateful to Prime Minister Tuilaepa for his unwavering commitment, dedication and all the hard work he puts in for the betterment of this country. Twenty years is a long time, a mighty wonderful milestone. The only question is, how much longer can he continue? Congratulations Prime Minister Tuilaepa! And have a great Friday Samoa, God bless!